No Convention of States! | A Balanced Budget Amendment is the WRONG solution to unauthorized spending by Congress! The Constitution isn't broken, the Electorate is! We are aware of several organizations that are contacting all state legislators in the nation to promote bills or resolutions petitioning Congress to convene an Interstate Compact which will create an NGO to obtain ratification for a Balanced Budget Amendment. In Arizona this bill is HB 2305. The Convention of States movement’s acclaimed safeguards are totally inadequate to prevent bad things from happening to a good Constitution. This noble attempt to restrain unconstitutional federal spending has a number of serious problems. THIS COMPACT DOES NOT PASS CRITICAL REVIEW and so is not worth the paper it’s printed on. (2) “pre-ratify” a specifically worded BBA so that it would not be necessary to get 38 states to ratify a BBA after proposal by the amendments convention. The basic argument against the Compact for America approach is that any Article V constitutional convention cannot be limited as to the subject matter or number of proposed amendments that would be considered. Although Article V of the Constitution certainly provides for the calling of conventions for the People to exercise their right to alter their government, over the past 30 years or so most state legislators have voted against enabling such open conventions to be held, believing that the risk to the Constitution posed by such open conventions outweighs any possible benefits from one or a few specific amendments. 1. Only an Amendments, or Article 5 Convention ITSELF CAN LEGALLY MAKE ITS OWN RULES-not an Interstate Compact, per U.S. Constitution Article V.
2. What part of NO does Congress understand? NONE. NADA. If Congress willfully ignores the authority of the U.S. Constitution now, why would we expect Congress to obey the Constitution when amended? This bill is smoke and mirrors and its proponents refuse to answer this question BECAUSE THEY CAN’T! 3. The Convention of States movement would pose an unacceptably high risk of damage to the Constitution; it opens the doors to all manner of unseen attempts to hijack, disrupt and redirect convention proceedings with a high possibility of language weakening its structure or even totally revising the Constitution completely! 4. It contractually forces Arizona to fund and otherwise support other agencies, lobbyists, or groups without constraint or legislative oversight. 5. Creates an indefinite commission that will last until long after its purpose is accomplished since THERE IS NO SUNSET CLAUSE. We don’t need another creature to wrestle to death when its supposedly finite purpose is achieved. 6. This is the same well known Balanced Budget Amendment movement periodically reappearing over the last three decades that has already been debunked many times over. 8. Here’s the obvious–what makes anyone think a BBA will restrain spending? A BBA WILL REQUIRE MASSIVE TAX INCREASES. States are already almost broke and WILL NOT mandate federal reductions because federal monies are states’ livelihood! Finding 26 states to approve federal spending on monies for the states WILL BE ALL TOO EASY. 9. Congress has authority to RAISE TAXES in spite of a BBA and AFTER a BBA. 10. The State of Hawaii issued a convention call in 2011; Congress is REQUIRED to include Hawaii’s and any other state’s call in any convention that Congress convenes, including Hawaii’s call to remove the existing 2nd Amendment recognizing the right to bear arms. Hawaii then calls for replacing it with ‘Obamacare’. Do we really want to chance this happening when all the cost and tremendous effort going into developing the Convention of States may create the temptation to compromise instead of dissolve it? 32 states already have calls to Congress for various topics. 11. MANY states INCLUDING ARIZONA have ALREADY RESCINDED previous calls for just such a convention and for GOOD REASONS, many noted herein; let’s not have to rescind this all over again. Binding Arizona by contract against rescission already places Arizona at disadvantage and may be illegal. 12. Furthermore, during the last 25 years the following states have passed resolutions rescinding all of their previous constitutional convention calls: Ala., Ariz., Ga., Idaho, Mont., N.D., N.H., Okla., Ore., S.C., Tenn., Va., Utah, and Wyo. The fact that Georgia is considering another bill to participate in the Convention of States merely shows 1) that special-interest lobbying can sway votes, and 2) legislators often lack the necessary understanding of constitutional precepts and application to legislation they are asked to consider. 14. Since the Constitution went into effect, there have been about 400 petitions from state legislatures calling for a convention to consider one thing or another. None of these efforts ever succeeded. a. Proposed amendments include: allowing prayers in the schools; prohibiting busing for racial balance; permitting the states to make abortions illegal; “People for a Safe America” has attempted to get Congress to pass the bogus “Safe America” Amendment; A new constitutional convention to consider the adequacy of our present Constitution, including interpretations of the Constitution by the Supreme Court, to the needs of our own time”; and many more! 15. Billionaire George Soros has VOWED to replace the U.S. Constitution by year 2020 and is in a position to take advantage of a convention to do so. While condemning what it calls “judicial activism” by conservative judges, the Soros funded American Constitution Society for Law and Policy (ACS) in fact encourages judicial activism by the left. d. The stated purpose of the conference, at which some of America’s best-known liberal law professors appeared, was to work toward a “progressive” consensus as to what the Constitution should provide for by the year 2020, and a strategy for how liberal lawyers and judges might bring such a constitutional regimeinto being. 16. The ratification process originally required 100% of the states to ratify amendments, now it is set to 75%. This weakening precedent exists and holds weight in future conventions, with proposals to drop ratification requirements to 50% plus 1. This will transfer our system of government from a constitutional republic to a fascist democracy! 17. If any or several of these consequences result from a legislator voting FOR this Convention, these consequences will taint a legislator’s political and character reputation beyond recovery. A TOTAL of $6 TRILLION spent over the last 10 years. That is 600 Billion per year! Except for declared war in defense of invasion, THESE ARE ALL STATE ISSUES TO BE CONSTITUTIONALLY ADMINISTERED BY STATES, not UNCONSTITUTIONALLY by the federal government. 20. FINALLY, A BBA IS NOT NECESSARY; it spurns the very Constitution the states already ratified: states ALREADY possess the power to prevent federal excess and usurpation. States have NOT entirely ceded their sovereignty to the federal government. In fact, the continuation of our Constitution and our Republic requires states to assert themselves and to reject any act of Congress that goes beyond the very narrow scope of authority granted to it by the states in the first place, by the Constitution we already have. This is called ‘Nullification’. This is called NULLIFICATION and RECALLING ELECTED REPRESENTATIVES who vote UNCONSTITUTIONALLY is the Rightful Remedy to unrestrained and unauthorized Congressional spending; state legislatures need to ENFORCE THE CONSTITUTION, NOT AMEND IT. We are very concerned that such a convention could lead to proposing one or more amendments that could have a very harmful effect on our freedoms under the U.S. Constitution. The Balanced Budget Amendment certainly harms working Americans and should not be enacted. Please vote ‘NO’ on HB2305 to call a Convention of States for a Compact using the Compact For America Interstate Compact and a Balanced Budget Amendment. Explains the arguments against passing the Compact for America legislative package. The younger Soros is right, but for the wrong reason. The prevailing spirit of the Constitution is antidemocratic, and is so by the very deliberate and express design of the framers thereof. Soros’ money is funding a large number of front groups to try to dismantle the U.S. Constitution in record time, since it guarantees to the states a Republican form of government–a greatly different government than the democracy Soros and Company are trying to implement (see Overview of America). One of the highest priorities for keeping our God-given unalienable rights to liberty is keeping intact the U.S. Constitution that recognizes and supports those rights. We MUST BE CAREFUL when amending it to keep its law and concepts robust and unchanged. In TODAY’S SOCIALIST-PROGRESSIVE-FASCIST POLITICAL CLIMATE there is no chance of holding an Amendments Convention without risking subtle or substantial, even wholesale changes to this Supreme Law of the Land. The information contained herein presents a very strong case for addressing the ROOT CAUSES of our economic problems (unconstitutional federal government: central banking system, wealth transfer programs and entitlements, usurpation of states rights, etc.) instead of using a ‘Band-aid’ approach. One does not repaint a car when the motor is broken. Organizing the state legislatures to submit to a constitutionally wayward Congress an Application for an Amendments Convention to try to force it to obey the U.S. Constitution is a Band-aid approach. Since Congress is forestalling public debt into the future for our children to pay and WILL NOT adhere to fiscal responsibility, it surely WILL NOT follow any amendment that restates the Constitutional Law already in effect. There is no denying the fact that, if the present balanced budget convention campaign succeeds in eliciting the necessary applications from 34 state legislatures, the convention call will be triggered by inadequately considered state applications; for the vast preponderance of the legislative applications rest on an entire absence of considerations of the risk of a convention route. In my view, that constitutes a palpable misuse of the Article 5 convention process. The convention route, as I have said, is legitimate when deliberately and knowingly invoked. The ongoing campaign, by contrast, has produced a situation where inattentive, ignorant, at times cynically manipulated state legislative action threatens to trigger a Congressional convention call. I cannot support so irresponsible an invocation of constitutional processes. There is another flaw in Dranias’ Executive Summary regarding the power of Article V, and it effectively impedes the Goldwater Institute’s march toward a new constitutional convention. Simply put, the black letter of Article V does not allow for a convention with any purpose other than “proposing amendments,” which if ratified by the states (by either of the two methods provided) would become “part of [the] Constitution.” Why would a constitutionalist, sincere in his desire to restore the proper balance between the state and national governments, advocate a convention to propose amendments to a Constitution that, according to both its authors and its plain language, already protects that delicate and unique balance of power between the states and the federal government? In December, 2008, my American Policy Center (APC) led a fight to stop Ohio from becoming the 33rd state to call for a Constitutional Convention (Con-Con). In the 1980’s 32 other states had passed Con-Con resolutions for the specific purpose of passing a balanced budget amendment. Had that resolution passed the Ohio legislature, we would have been just one state away from such an event. We argued then that one cannot call a Con-Con to discuss just one issue. Once a Con-Con is in place, there is no controlling the agenda. We fought to stop the Con-Con because of fear. Today there is massive ignorance among the American people about the Constitution. Worse, there are powerful forces who consider that document to be antiquated and a hindrance to their vision of an all powerful government. These things, and more, make today the worst possible time in our nation’s history to mess with the greatest governing document of all time. We stopped the effort in 2008, but the battle is on again as an even more determined plan is under way to gather support from the nation’s governors and state legislatures to pass Con-Con resolutions. Again, this is not the work of wild-eyed leftists intending to gut the Bill of Rights. This is an effort by conservative legislators who are alarmed by the growing power of government. The main groups pushing for a Con-Con are the American Legislative Exchange Council (ALEC), a conservative association of state legislators; and a new group calling itself the 10 Amendments for Freedom, Inc, chaired by William Fruth, President of POLICOM Corporation, which provides independent economics research. Fruth then scoffs at our fears of a Con-Con and efforts to stop it. He says, “Simply, it is not reasonable to assume there can be enough delegates sent to a convention who will propose amendments which ‘repeal the Bill of Rights’ or ‘legalize socialism.’ Even if they did, the amendments would never be ratified,” concludes Fruth. These are the arguments now being presented to every single state legislator and Governor in the nation as Fruth and ALEC put on a full-court-press to call for a Constitutional Convention. While the intention may be an honest desire to reign in the power of government, the fact remains that every one of these arguments for a Con-Con is wrong. Article V gives absolutely no guidelines as to how it will be run, how delegates can be selected and who can do the selecting. Once the 34 states make the request, the entire matter is in the hands of Congress to decide. It does not matter if the states passed resolutions as Fruth proposes, containing absolute guidelines for delegate selection. The Constitution provides no rules – it is up to Congress to decide how delegates are selected and what qualifications they will have. The guidelines proposed by Fruth carry absolutely no weight in the final process – even if every state passes the exact same resolution including those rules. Again, Article V simply says that when 34 states have called for a Con-Con the Congress “shall call a Convention…” Period. And there is more legal documentation proving that Congress or the states can control the agenda of a Con-Con. Corpus Jurus Secundum is a compilation of State Supreme Court findings. The following is the collection of findings regarding the unlimited power of the delegates attending a Con-Con. (From Corpus Jurus Secundum 16 C.J.S. 9) “The members of a Constitutional Convention are the direct representatives of the people (1) and, as such, they may exercise all sovereign powers that are vesting in the people of the state. (2) They derive their powers, not from the legislature, but from the people: (3) And, hence, their power may not in any respect be limited or restrained by the legislature. Under this view, it is a Legislative Body of the Highest Order (4) and may not only frame, but may also enact and promulgate, Constitution. (5)” The footnote numbers after the citation quoted reference the particular cases from which the citations were made. (1) Mississippi (1892) Sproule v Fredericks (11 So. 472); (2) Iowa (1883) Koehler v Hill (14N.W. 738); (3) West Virginia (1873) Loomis v Jackson (6 W. Va. 613); (4) Oklahoma (1907) Frantz v Autry (91 p. 193); (5) Texas (1912) Cox v Robison (150 S.W. 1149). Clearly, the position put forth by Fruth, and ALEC, that state legislatures can pass a resolution dictating the rules of the Con-Con is simply wrong. But again, none of that will matter, according to those calling for the Con-Con. William Fruth argues that no matter what such a convention does, it still must be ratified by two-thirds of the states, making it very difficult to do bad things against the will of the people. A history lesson is in order. Do you trust them to follow the rules dictated by state legislatures? Do you think Pelosi and Reid would pass up an opportunity to set their own rules to guarantee a Constitution to their liking? Do you think for one minute that they would take any steps to protect our Constitution? We live in an era when the Supreme Court looks to foreign laws to assure our own laws are worthy. We live in an era when many believe that the Constitution is out of date for our times. Barack Obama has expressed his belief that the U.S. Constitution needs to be interpreted through the lens of current events. Pelosi and her cohorts are itching to get their hands on the old parchment. And as history has shown, once a Con-Con is called, delegates (picked though a Pelosi process) can do anything they want to it, including writing a completely new document. And there is more. Concerning the argument that no matter what the delegates produce, the states still must ratify it – thus serving as a safeguard to tomfoolery, consider this fact: The Articles of Confederation required that any changes be ratified by 100% of the states. 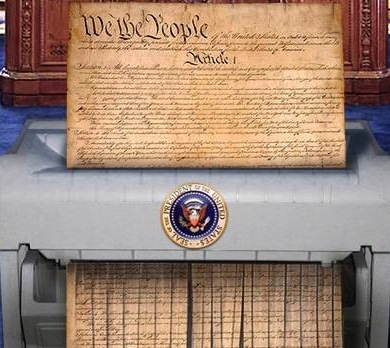 That was the document that was the law of the land – until something else was put into place. But, when the new Constitution was put to the states for a vote of ratification, suddenly they needed only two-thirds to approve it. Why? The fact is, Article V of the new Constitution was used – even before the Constitution which contained it was approved. Now, what do you think Reid and Pelosi and company would do with that precedent? What if the new document produced by the Con-Con said ratification only required a vote of Congress – or some special commission? The precedent of 1787 says that could happen. So much for protection by the states. These are the reasons why I, and many others around the nation, adamantly oppose a Constitutional Convention at this time. We fear a Con-Con because the subject matter cannot be controlled. And if the worst happens, there is no guarantee that we can stop ratification. There has never been a worse time in the nation’s history to consider changing this grand document. The Con-Con delegates could literally put the Constitution on an operating table and use their scalpels to slice it up, creating an entirely new form of government. That new document, as precedence has shown, could be enforced without ratification by the states. Remember, our current Constitution was not ratified by the rules set forth in the Articles of Confederation, but by an Article V that wasn’t yet law of the land. Now that the precedence is there, it can happen again. The Pelosi’s of the nation, proven to have the power and the will to twist any issue or initiative as they desire, are rubbing their hands together at the prospect of a Con-Con. No doubt there is great need for several of the amendments Fruth and his group propose. But he seems to ignore the fact that there is a powerful, organized opposition. Again, I call your attention to the continuing battle over health care. That’s child’s play compared to what will happen in a Con-Con. Do Americans really want to risk that in these uncertain times? Every freedom-loving American must stand up against this misguided call for a Con-Con. Tell your state legislators NO. The Freedom Movement, so necessary to end the growing tyranny in our nation is being destroyed from within. Tom DeWeese, president of American Policy Center and editor of the DeWeese Report gives a special report on who is behind it. Click on the image below to watch this powerful video featured on YouTube. “I’ve been going back and forth on this with Nick Dranias for MONTHS. If AZ calls for an amendment, but 38 states call for something else, does Arizona control the convention? NO. Once the delegates have convened, they become the highest power in the land and Arizona’s “INTENTION” in their call becomes IRRELEVANT as the rest of the delegates can override. Even if Arizona “walks out”, but the rest of the states rewrite the constitution, the only option left for Arizona would be to secede. There are other ways to pass an amendment. A constitutional convention is not required.